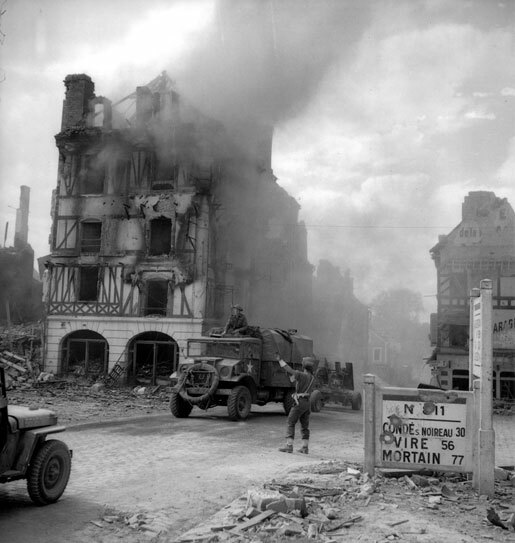 A convoy travels through Falaise, France, Aug. 17, 1944. American General Omar Bradley’s decision to stop Gen. George S. Patton’s 3rd Army at Argentan, France, on Aug. 12, 1944, gave the German armies in the Falaise Pocket a chance to escape encirclement. Montgomery accepted Bradley’s decision and ordered the Canadians to capture Falaise before turning east to close the gap at Trun and Chambois. 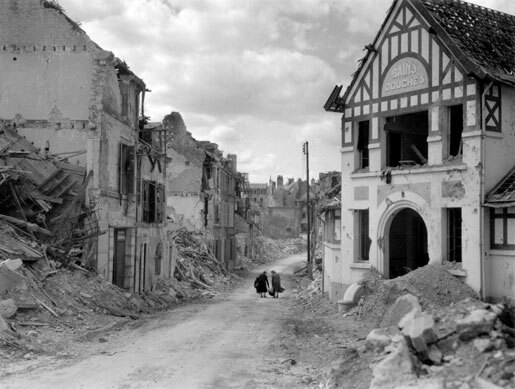 On the morning of Aug. 15, three Canadian divisions converged on Falaise, a town which the corps commander, Lieutenant-General Guy Simonds, thought was the wrong objective. Simonds could not disobey orders, but he could decide to use his only reserve, the battered Polish Armoured Division, to manoeuvre around the German positions and strike south to meet the Americans at Chambois. 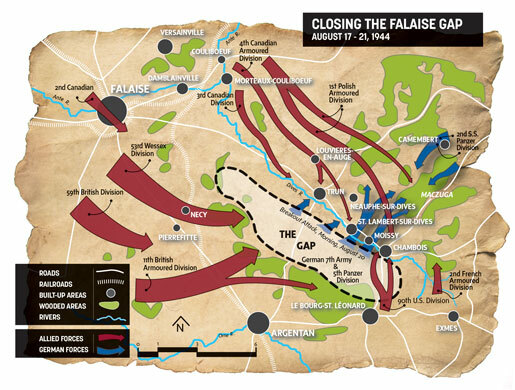 Closing The Falaise Gap August 17 – 21, 1944. The armoured brigade secured the area which the enemy “defended furiously” and during the night the 3rd Rifle Brigade took over the bridgehead forming a firm base. The Poles captured 120 prisoners from 272nd and 85th divisions, claiming the destruction of three Panther tanks as well as anti-tank guns and an artillery battery. The Polish advance was facilitated by an order requiring the Luftwaffe flak regiments to withdraw out of the pocket, thus removing the 88-mm guns covering the area. This withdrawal, however, should in no way diminish the brilliance of the Polish achievement in a classic armoured manoeuvre role. 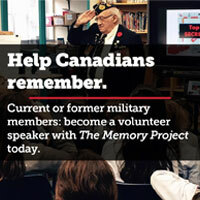 By the morning of Aug. 16 it was clear that 2nd Canadian Div. would enter Falaise that day. Simonds ordered 4th Armoured Div. to turn 180 degrees and join the Polish Armd. Div. advancing to Trun. Unfortunately, both divisional and brigade orders groups for the attack on Falaise had been held earlier that morning and battalion commanders were briefing their officers when the new order arrived. Since it would take some time for the division to disengage and reassemble, Simonds decided to use the day for rest, reinforcement and refitting, beginning the advance early on Aug. 17. The Canadian Grenadier Guards, whose tank strength had been reduced to 23 Shermans, were grateful for the chance to obtain replacements, but only 10 were available. The Governor General’s Foot Guards were able to obtain enough tanks and crews to operate with two squadrons, each of 12 tanks. Two armoured divisions were now committed to closing the Falaise Pocket from the north. This action contrasted sharply with the continuing confusion on the American side of the pocket, where plans to attack towards Chambois on the morning of Aug. 17 were postponed due to uncertainty about command arrangements. Montgomery made no attempt to pressure the Americans, instead he flew to Bradley’s headquarters to discuss how to trap the Germans at the Seine and to broach his idea of a single thrust to the Ruhr. After the meeting he contacted Gen. H.D.G. Crerar and told the Canadian Army commander “that it was absolutely essential that both the Armoured Divisions of 2 Canadian Corps…close the gap…1 Polish Armoured Division must thrust on past Trun to Chambois at all costs and as quickly as possible.” Montgomery allocated an additional armoured division, the famous 7th Desert Rats to the Canadians, but it was to support the advance north, not the struggle to close the gap. 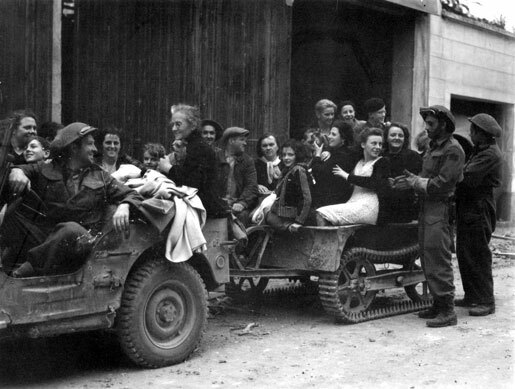 French citizens are evacuated by the Fusiliers Mont-Royal, Falaise, August 1944. Montgomery’s nightly report to London stated that “the gap has now been closed,” although he noted there were clear signs “the Germans are going to attempt a major breakout tonight.” He estimated that five panzer divisions and “a good mess of immobile infantry were still west of the Argentan-Falaise road” and thought it “quite possible elements will get through.” He added that “we now sit astride the main roads leading east but have not had time to organize definite blocks of every exit.” There were, of course, no blocks on the Chambois-Vimoutiers highway or the roads through Trun. Montgomery, his thoughts focused on the Seine and beyond, was mistaken or exaggerating progress. During the night of Aug. 17-18 the bloodied and surviving fragments of the German 7th Army withdrew across the Orne and through the 19-kilometre gap between Argentan and Falaise. Their goal was to reach the densely wooded areas northeast of Argentan before daylight, a distance of some 18 kilometres. On the northern flank, the battle groups of 12th SS and 21st Panzer divisions held positions north of the Falaise-Trun road in hope of keeping the highway open. The next morning, Field Marshal Walter Model arrived to take over from Field Marshal Gunther von Kluge who, after writing an obsequious letter to Hitler, committed suicide. Model’s first order, for all his brave words about “a new front before or behind the Seine,” confirmed Kluge’s decision to withdraw as quickly as possible, if the Allied air forces would let them get away. The tactical air forces flew a record 3,057 sorties on Aug. 18 with the Royal Air Force alone claiming 124 tanks destroyed and 96 damaged. Air-to-ground action was particularly hectic west of Trun, but targets were found throughout the pocket and inevitably many Allied units were attacked. Casualties from friendly fire slowed the Polish Armd. Div. during its advance towards Chambois which paralleled the German escape routes and 51st Highland Div., which was also heading east, reported 40 incidents of allied air attack on Aug. 18. The Canadians, moving south to Trun, were less likely targets but the town itself could not be occupied until air attacks, in this case by Thunderbolts of the 9th U.S. Tactical Air Force, ceased. The rich array of targets in the pocket proved irresistible to the fighter pilots of both air forces and attempts to divide up the territory between rival and highly competitive groups had little effect. 2nd Tactical Air Force demanded that 9th Air Force stay out of the immediate battle area, which, Air Marshal Sir Arthur Coningham insisted, was reserved for 2 TAF, but American pilots were unwilling to accept such restrictions which limited their ability to support American ground forces which had finally begun to move. Two women carry their meagre possessions. The American corps tasked to close the gap from the south had three divisions available, but the commander of the French armoured division, General Jacques Leclerc, was determined to avoid involvement in a battle which might prevent his division from participating in the liberation of Paris. The French division’s role was limited to artillery support and flank protection for the Americans. This left the 80th U.S. Infantry Div. with the task of bypassing Argentan and moving north towards Trun, while 90th U.S. Inf. Div. advanced from Le Bourg-St. Léonard to Chambois. The 80th, attacking with just one regiment across rising ground, was unable to make any progress and the attack was called off. The 90th was more successful. The leading infantry battalion “outflanked resistance” and closed to within two kilometres of Chambois before a Werfer brigade and elements of 116th Panzer Div. checked the attack. American commanders were content with this modest advance because their artillery battalions were finding and hitting targets all across the gap. That night Allied artillery continued to pound the enemy, but the roads north of Chambois remained open and in use. Clearly Montgomery was content with actions designed to squeeze the pocket while the air force dealt the final blows to the enemy. Those who made it past Chambois faced the squadrons of 84 Group waiting for morning to pounce on the thousands of vehicles strung out on the roads around Vimoutiers. Tactical air force claims may have been exaggerated but panic, chaos and destruction among the enemy was everywhere visible. 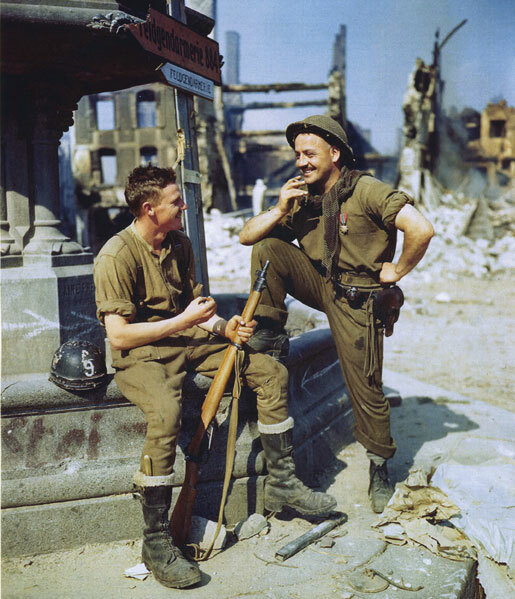 Two privates relax in a square in Falaise. The decision to employ air power, rather than a sufficient number of ground troops was cost effective and, when combined with great quantities of artillery fire, capable of destroying the combat power of the remaining enemy forces. But air power could not occupy ground and complete the encirclement so Allied commanders did not cancel orders to close the remaining exits from the pocket. There was, however, no sense of urgency. The senior commanders focused on future plans and the two corps commanders hesitated to commit additional resources to a difficult, costly task which was better left to the air force. By mid-afternoon on Aug. 18, 4th Armrd. Div. had secured Trun and controlled the main road to Vimoutiers and Rouen. The Polish division’s Recce Regt. was on the outskirts of Chambois waiting for the Allied air attacks to end. Most of the Polish division was digging in on the Maczuga, Hill 262 North, high ground which overlooked the last paved road out of the pocket. Meanwhile, German soldiers were using minor roads between Trun and Chambois to escape, and Simonds ordered Major-General George Kitching to close the gap using Brigadier J.C. Jefferson’s 10th Inf. Bde. Jefferson sent the brigade’s armoured battalion, the South Alberta Regt., with a company of infantry, Argyll and Sutherland Highlanders of Canada, towards Chambois with Major David Currie’s C Squadron in the lead. Despite strafing attacks by Spitfires, Currie’s battle group reached the village of St. Lambert-sur-Dives at dusk. A bridge, located in the centre of the village, was held by German troops. It offered the only remaining exit route for heavy vehicles. The stage was now set for the dramatic battle for control of St. Lambert which we will examine in the next issue. Stopping Gen. Patton and his Army from closing the Argentan-Falaise Gap, and sending Montgomery’s Army in so Monty could claim the glory, is a perfect example of politicians monkeying around with peoples’ lives. Stopping Patton allowed several thousands of Nazi soldiers-and many Nazi Commanders-to escape, regroup, and set up the attack through the Ardennes (the Battle of the Bulge). This costs tens of thousands more of Allied personnel to be killed/ wounded. I consider this political manipulation to be an atrocity of the greatest magnitude, and the FDR regime is entirely to blame. That is a gross oversimplification based on the pop-culture version of history where Gen. Patton was an invincible angel of war, while Montgomery and “them evil politicians” were evil little gnomes attempting to undermine his glory at every turn. The reality is that whether it was the optimal choice or not, stopping Patton at Argentan was a military decision made for military reasons. Patton’s troops, limited in number, were already blocking three German escape routes at Alencon, Argentan and Sees. Had he been allowed to advance further, his forces very possibly might have become stretched so thin that the escaping German forces might have easily broken through. It was not unreasonable for Bradley to decide that blocking three routes securely was better than risking overextension and compromising four. Oh, and it wasn’t “politicians monkeying around with people’s lives”, it was Gen. Omar Bradely making that decision, who had a reputation of being a “soldier’s general”. Short of Troops? Patton was not short of troops after the breakout. He was furious he was not allowed to advance further and from reading my fathers letters and diary (He was 3rd Army, 4th Armored Division) it was evident Patton had more than enough forces to close the gap (as many (beyond the tactical reserves) were left sitting waiting for further orders, such as 5th Armored) but that it was Montgomery that insisted that the British forces be allowed to close the gap from the north in his conversations with Eisenhower and “accepted” Bradley’s decision already knowing it was coming from Eisenhower. It was the Poles and Canadians that paid the price for this stupidity. Especially the Poles who suffered very heavy losses while holding the high ground and trying to close the roads on the north side with artillery fire. Likely the ‘gap’ was not closed expeditiously so as to create a killing field such are the sensibilities of war. My father with the RC Artillery at the ‘gap’ and firing over open sights strongest recollection of the war was the overwhelming stench of the German dead, many ripped apart and laying out in the hot sun. Eisenhower stated with pride that on an open field he couldn’t step with treading on a dead German. This is what takes place when war takes over the the minds and lives of men on which ‘side’ they are fighting for….. This is untrue. Patton and Monty were effectively singing from the same hymn sheet. It was Eisenhower who persuaded Monty to amend his original plan in favour of making the circle smaller. It should also be remembered by those who criticize the Poles and Canadians that they were involved in heavy duty fighting against fanatical SS troops. The fighting to the north of the gap was far more intense than elsewhere. In my opinion, despite his explanation, there is an argument, accepted by many historians, that Bradley should have committted more of his troops to closing the gap.